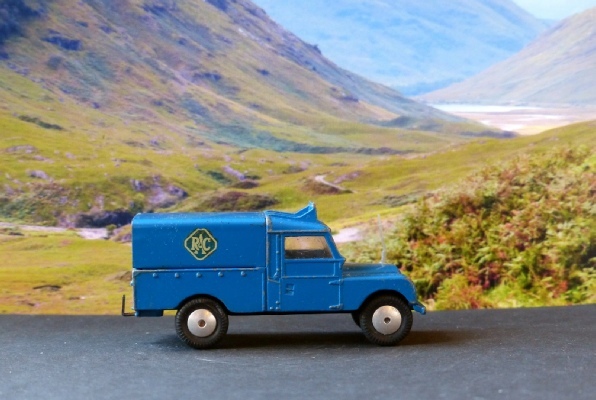 A MkI type Land Rover in RAC blue with a blue roof and matching tin canopy. This is very old but is almost perfect - superb example. There are two types of this Mk1 Land Rover in RAC guise. The difference is that the very earliest editions had the sign on the roof and just <RAC> transfers on the canopy. Later versions of the Mk1 Land Rover had no headboard and RADIO <RAC> RESCUE on the canopy. Each can be found with smooth or shaped wheels although I believe that the headboard version with shaped wheels will be rare. I have written about this at length in my blog. Later, a MkII version came along with suspension and an interior and continues without the roof sign.